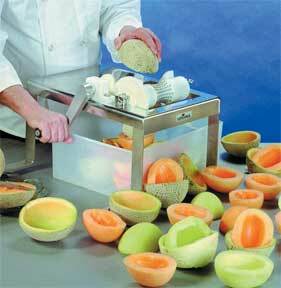 Peels cantaloupe, honeydew and similar melons in a matter of seconds, producing smooth-shaped melon “bowls”. Works on melons sized from No. 5 to No. 23 count. Watermelon Peeler also available. Includes 2 interchangeable peeling knives, seed scooper, cleaning brush and training video.